Victory | Beer Apprentice - Craft Beer News, Reviews, Interviews and Info. Hi guys. 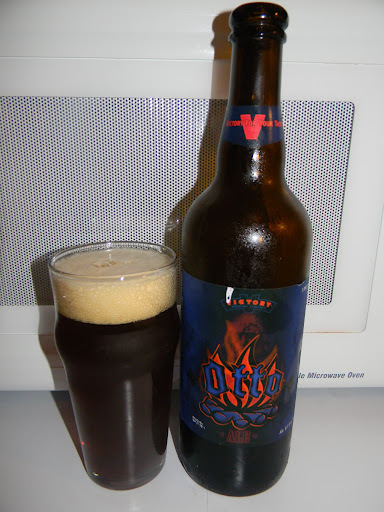 For today’s craft beer review I thought I would share with you in my experience of tasting the Victory Otto produced by the Victory Brewing Company located in Downingtown, Pennsylvania. A big thanks to Ryan Hudak (insearchofbeer.org) for sending me this a while back. I’m just now getting around to trying it. I don’t know what has taken me so long. Honestly, I kind of forgot that I had it. It was stuffed in a box that I had stored away with some other “big” beers. Well, anyway. Let’s get to the website, victorybeer.com, and see what we can find out about this brew. In 1987, when we arrived in Bamberg, Germany for the first time, St. Otto was not there to greet two thirsty travelers in a rented Fiat. He’d been dead for 848 years but we were alive, and our recent visit to the Belgian brewery of Orval only fanned the flames of our desire for fermented pleasures. the smoked malt(’rauch’)beers of this lovely town where St. Otto was once bishop were our siren song, luring us into deep, exotic flavors that we never before imagined in beer. Three decades later we wondered what smoked malt might add to a Belgian-style dubbel ale. Here it is, an Otto revival of sorts. We hope it helps rejuvenate some of our brain cells that were martyred in Bamberg so long ago. Alrighty then. Let’s give it a go. The Otto came in a 25.4 oz. bottle and it had an ABV of 8.1%. It poured a brown to deep burgundy color with a small amount of burnt orange highlights around the bottom of the nonic glass. The head was off white and kind of soapy and fizzy. I was expecting it to be a bit smoother and creamier to be honest. Oh well. The size was still ok and lacing didn’t look too bad. The aroma brought forth a solid hint of smoke along with toasted bread tones and country ham. As the brew warmed a bit it started to reveal a smidgen of sweetness as well as a dark fruity fig or something. Also, a light touch of spice added just a tad bit more complexity. Not bad at all. I liked the bouquet quite well. The taste released further relishes of smoked meats. Similar to bacon and ham. I also discovered some toasted grains, breads and yeast. The fruity fig does come through a little bit at the back end as it warmed, however it was actually mostly the smokey/woody character. That was fine with me though because I enjoyed that aspect very much. I didn’t really discover any spice or anything. Hmm. Maybe it was just hidden really well. The mouthfeel was medium bodied. Smooth, dry and kind of chewy. The carbonation seemed a touch low, although it did leave an ok amount of flavor behind after each swallow. All around, I thought this was a pretty good beer. I really liked the combination of the “smoked” style intermingled with the dark, fruity, bready Dubbel style. Very interesting. I had yet to try a beer like that. I don’t know that I would go so far as to say that this is the greatest “smoked” beer on the market, but it’s still pretty darn tasty and I would have no problem trying it again. You should give the Victory Otto a sample as well if you happen to see it. The drinkability is decent and it has enough character to keep a person interested for the duration. Hello everyone. For today’s craft beer review I’m going to be drinking the Victory Baltic Thunder produced by the Victory Brewing Company located in Downingtown, Pennsylvania. I’ve always liked the Porter style, so I’m hoping this one stands up to some of the others that I’ve had. From the website, victorybeer.com, we find this bit of information concerning the Baltic Thunder. Truly a worldly beer. 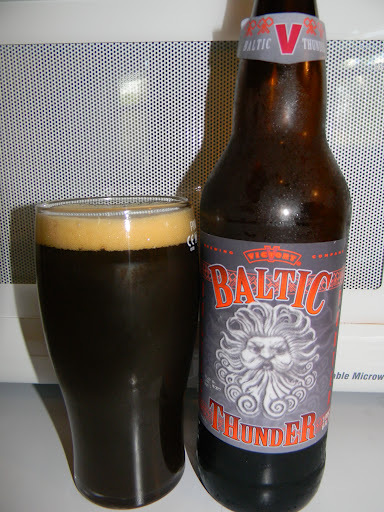 Baltic Thunder represents the Baltic Porter style admirably. Exhibiting the enticing, toffee roast of the British porter that originated the style in the 18th century, and the soothing, subtle fruit nuance of contemporary brews that flourish from Helsinki to Vilnius today, this dark lager honors the Baltic god of thunder. Created by an inspired collaboration of brewers and tempered with a touch of turmoil, Baltic Thunder rolls on to bring you enchanting light as the darkness fades. This brew comes in a 22 oz. bomber and it has an ABV of 8.5%. It poured a deep brown to deep burgundy color with some burnt orange highlights around the edges. The head was off white and kind of small, but the texture was rather creamy and smooth. The retention time was not great and the lacing was slight to say the least. The nose brought forth a decent tone of roasted malt. Toasted breads and grain mostly. A nice toffee sweetness combined with some fruity fig, which in turn made the aroma smell very similar to a Fig Newton bar. Just a little touch of chocolate was accounted for and only a smidgen of coffee bean was found as well. Overall, not bad on the bouquet though. The taste released more of that toffee sweetness. Definitely more of the roasted malts and grains, although the fig seemed quite relaxed in the taste as compared to the smell. It was relatively bitter, however the chocolate wasn’t all that pronounced. I also notice some “day old” coffee flavors too. Toward the end I began to notice a relish of burnt wood, earth and chalk. There seemed to be a lot going on with the flavor, yet nothing seemed to be harmonized all that well. I would pick up on aspects of each component with every sip, but nothing remained consistent. It could have just been me. Who knows? The mouthfeel was medium bodied. Dry, somewhat chalky, but mostly smooth. The carbonation seemed about right. A touch of warmth was felt from the alcohol and a good dose of flavor was left behind on the palate after each sip. Well. This beer was ok. I wouldn’t necessarily say that it was the best Baltic Porter I’ve ever had, but it wasn’t the worst either. It just didn’t seem to be balanced real well and the aromas and flavors were not as rich and robust as some of this style can be. The drinkability was passable and I would have no problem drinking it again, however I don’t know that this would be the first Baltic Porter that would come to mind when asked for my favorite. That’s not saying that you wouldn’t love it if you were to try it though. This is just my inexperienced take. So, pick up the Victory Baltic Thunder and see what you think. I would be interested in hearing your opinion. Hello once again. For today’s craft beer review I’m going to be trying the Victory Golden Monkey produced by the Victory Brewing Company located in Downingtown, Pennsylvania. I’ve had the opportunity to try several brews from Victory now, and I’ve been rather pleased with them. I’m hoping this one continues the trend. From the website, victorybeer.com, we find this description of the Golden Monkey. Strong and sensual, this golden, Belgian-style ale glows. The richness of German malts and Belgian yeast are tempered by a sparkling approach and overall light body. Abundant herbal, fruity notes make Golden Monkey® one to savor. This brew has an ABV of 9.5% and it comes in a 25.4 oz. bottle. The Golden Monkey poured a hazy, golden/orange color. The head was white and of real nice size. It was a touch soapy, but smooth and soft in texture. The retention time was commendable and the lacing looked pretty nice too. The nose was very clean and fresh smelling. Hints of orange and lemon citrus along a light touch of pear. Floral scents and some grassy factors were found combined with tones of Belgian yeast and cloves as well. The overall bouquet was not terribly strong, but it definitely had enough complexity to keep me interested. The taste brought forth more of the lemon citrus, orange zest and minuscule tones of pear. Very lively and bright. The bready and yeasty accents added some depth while spices of pepper and cloves gave it a slight bite. Just a tiny recognition of alcohol was felt at the back end. Again, not considerably strong or robust, but rather easy going. The mouthfeel was medium to medium/light in body. Quite a bit of that prickly carbonation stung the tongue at the beginning. It was nice and crisp, snappy and refreshing. A small amount of warmth was felt from the alcohol and a decent amount of flavor was left covering the palate after the swallow also. Well, I think this is another favorable beer from Victory. It’s easily worth trying if you can get your hands on it. It was just a little bit meek on all fronts, but that in no way deterred from my enjoyment of the experience. It’s super easy to drink and would pair exceptionally well with the Spring and Summer heat. This would be a great beer for an introduction to the Belgian Triple style. It has plenty of the proper characteristics without being too aggressive or demanding on the senses. 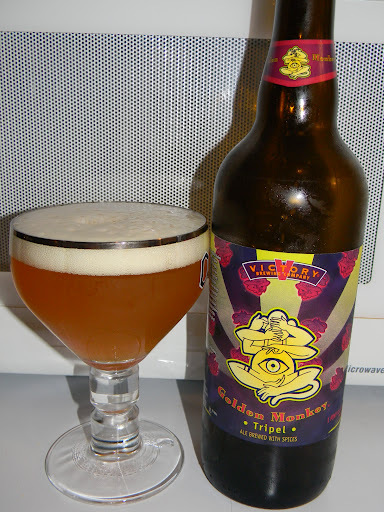 So, if you’ve had the Victory Golden Monkey be sure to let me know your opinion. I’d love to hear from you.